Super Retail Group’s newest internal support team member is an AI assistant dubbed ‘Ask Geeves’. The retail group has recently completed a pilot with AI company OutThought, using an AI assistant to help team members with their internal support enquiries. Using OutThought’s cutting edge Conversational Commerce platform, Super Retail group were able to deliver the pilot in less than four weeks. The retail group selected OutThought’s platform because its accelerated deployment capabilities aligned well with its strategic ‘test and learn’ culture, which enables the adoption of new, innovative technologies in a rapid, agile fashion. OutThought’s Conversational Commerce platform allowed the AI assistant to be deployed with the press of a button to Slack, the retail group’s preferred internal collaboration channel. WhatsApp, web chat, SMS on mobile devices were among the other available options considered by the retail giant. Benchmark tests designed by Super Retail Group to measure the effectiveness of ‘Ask Geeves’ had some compelling outcomes, servicing experienced staff faster than their traditional search methods and increasing the accuracy of responses significantly. The retail group were particularly focussed on user experience, finding that users rated their experience using Geeves as above average or great, even if it was unable to assist with their specific query. OutThought’s cloud-based platform uses the latest AI technology, including Natural Language Processing backed by IBM Watson. With the choice to operate it through a number of conversational channels, including Facebook Messenger, Slack, WhatsApp, native web or mobile, users are able to interact with the bot on their preferred channel or device. With its build once, deploy many system, organisations can engage their customers across multiple channels without incurring the costs that a multi-channel strategy would typically involve. Bouari added, “what would normally take some organisations 6 months to implement we were able to achieve in 4 weeks from design to go-live”. 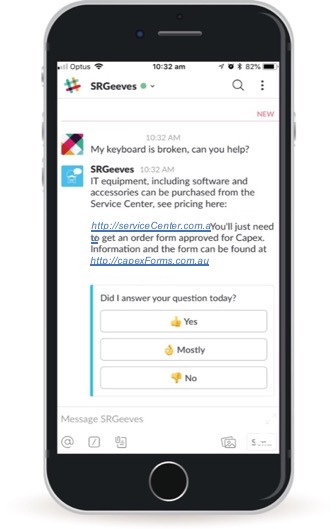 During the interactions with Ask Geeves, OutThought’s AI assistant quickly demonstrated its value by helping Super Retail Group discover new high-trending support issues that had not previously been identified as top requested items. The newly discovered high trending items allowed the group to manage changing and evolving user needs. There were several new possible applications identified at the conclusion of the pilot by Super Retail Group executives, who were excited about the potential benefits to the business.